The bamboo garden design does not just focus on plants; it also provides opportunities for outdoor furniture and bamboo structures. Information related to plants is at the top of this page and other garden related topics such as fencing, fountains, and furniture are linked from further down. You will find links to other pages about products such as; tiki bars, benches and gazebos, wind chimes and fountains, fencing or garden borders and edging. 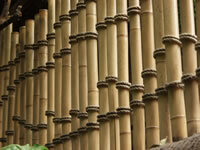 Whatever type, size, or design of garden or yard you have there are plenty of bamboo to choose from! The huge number of species means that you can't fail to find some to suit design ideas for your bamboo garden with different species being suited to different conditions such as climate and soil. Some species are adaptable for growing in both the ground and containers. If you don't want to plant your new bamboo out just yet, are undecided as to where to site it in the garden, or if you are like me and like to move your plants around occasionally, plants in pots is an excellent idea! Small bamboo can be used for ground cover, be grown in containers, or used as accent plants. Ground cover plants help to retain moisture in the soil and can be applied to landscaping designs, erosion control, for under planting, and as a cover for sloping ground. 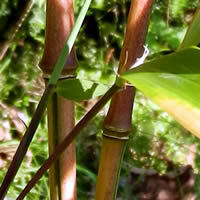 There are many varieties of dwarf bamboo that are excellent for these purposes. 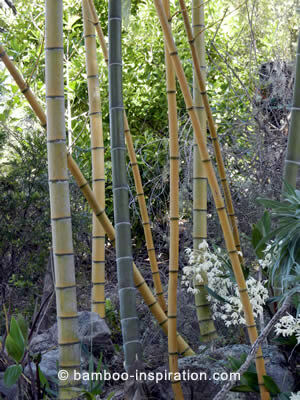 Please see my section about small bamboo for more information and a species list. Bamboo hedging can make quite an impact and can be trimmed. Follow this link for a list of suitable species and detailed information. Bamboo plants can easily be cultivated into a privacy screen and can be trimmed or pruned to suit the design of your garden. For more detail and a list of suitable species have a browse through my page dedicated to screens. Bamboos plants are a good choice for domestic gardens or commercial windbreaks because they can be; cultivated, pruned or trimmed... and can even be harvested for a variety of crafts and hobbies. For detailed information on windbreaks please see my dedicated page that includes; reducing wind force, strong root mass, flexibility, stability, and an abundance of species to choose from. Some bamboo garden species suit growing in containers, handy if you haven't enough open ground space. This is an excellent idea, particularly if you are worried about the plant spreading, and it also provides a way of moving everything around in the garden now and then to create a different environment. I have bamboos and several large trees in pots too! Choose from endurable and stylish products made from bamboos, the environmentally friendly alternative to wood for a green future! Using bamboo for fencing instead of wood is another way to help reduce the deforestation as well as creating a stunning look for your bamboo garden. Wind chimes are usually hung in the garden outside your home or inside an open window, and are played by the wind. Looking for a nursery? I can recommend the following in the US, Mad Man Bamboo with over 120 varieties of bamboos to choose from, and NJ Bamboo who are experts at bamboo landscaping and maintenance.